A welcome respite from the glitz of the Las Vegas Strip, a boat ride on the Colorado River provides the chance to admire the natural scenery of the American Southwest. Here are some options depending on your interests, from low to high intensity. White-water rafting through the Grand Canyon is one of the most popular ways to explore the Colorado River. As you navigate the river rapids, you can take in the beauty of the canyon from its lowest point. Calm rafting experiences are also available on certain sections of the Colorado River, such as Black Canyon or the base of the Hoover Dam, where a large, stable, motorized raft provides a scenic ride with a guide. River rafting day trips from Vegas make for long days, typically lasting 15 to 17 hours and including a guide and lunch. Some tours include transport from Las Vegas hotels while others give travelers the option to drive themselves to the launch point. Most Grand Canyon combo tours include a boat ride inside the canyon, but others may visit other nearby sites. Tours to the Grand Canyon West Rim from Vegas often combine a river cruise with activities such as a helicopter ride or a visit to the Grand Canyon Skywalk. Typically, you'll travel either by vehicle or helicopter from the city to Grand Canyon West, and then descend to the canyon floor (also by helicopter) to board a pontoon boat. This stable vessel takes you on a relaxing journey along the river, usually about 15 minutes long. Tour duration ranges from 3.5 to 12 hours depending on the activities included. 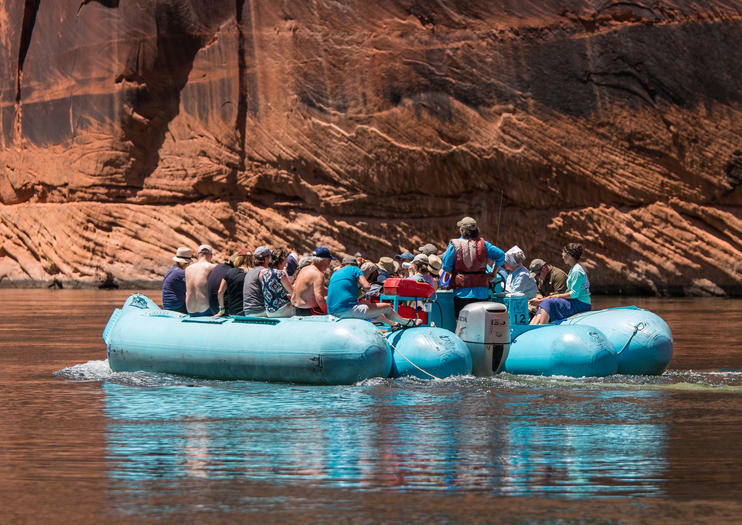 Add a thrilling outdoor adventure to any Las Vegas vacation with this guided, full-day whitewater rafting trip down the Colorado River. Enjoy a 2.5-hour road trip south to Peach Springs, Arizona, home of the Hualapai Indians at the gateway to the Grand Canyon. Then, challenge the mighty Colorado River’s varied rapids on a 40-mile journey through the canyon, taking a side hike to a travertine waterfall along the way. A boxed lunch and a hotel pickup and drop-off are included. Add a thrilling outdoor adventure to any Las Vegas or Flagstaff vacation with this guided whitewater rafting trip down the Colorado River. Take a road trip to Peach Springs, Arizona, home of the Hualapai Indians at the gateway to the Grand Canyon. Then, challenge the mighty Colorado River’s varied rapids on a 40-mile (64-kilometer) journey through the canyon, taking a side hike to a travertine waterfall along the way. Helicopter transfer (if option selected) and boxed lunch are included, and an optional hotel pickup and drop-off is available. Travel to the West Rim of the Grand Canyon by luxury SUV on this small-group tour from Las Vegas. You have several upgrade options: take a full tour of Hoover Dam en route; fly to the bottom of the Grand Canyon in a helicopter for spectacular views; or cruise down the Colorado River by boat after the heli-flight. Spend free time exploring the Grand Canyon's attractions at your leisure. Round-trip hotel transport and lunch are included.